Indiana foster parents abuse 8 kids, force child to put dirty diaper in mouth. Pictured, Aurora, Indiana foster parents, Diane and Timothy Combs. Image via police bookings: Dearborn County Sheriff's Office. Pictured, Aurora, Indiana foster parents, Diane and Timothy Combs. Image via police bookings: Dearborn County Sheriff’s Office. Indiana foster parents, Diane and Timothy Combs abuse 8 kids, forcing one child to put dirty diapers in their mouth. Booked with 22 child battery assault charges. 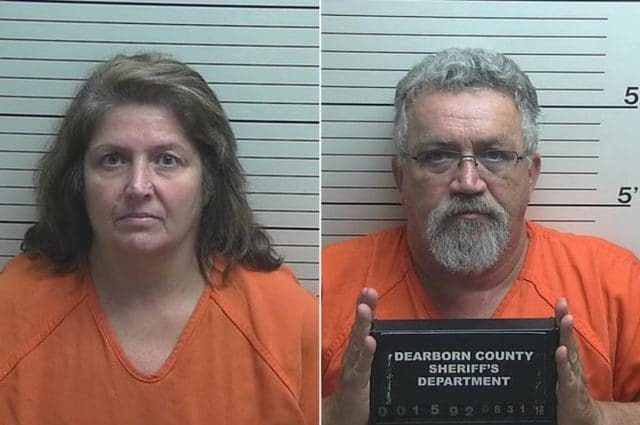 Indiana authorities have brought child abuse charges against a husband and wife foster parents following revelations of rampant disregard of children in their care. Booked were Timothy Combs, 59 and his wife, Diane Combs, 55 of Aurora. The pair’s arrest followed a child in their care recording an instance of alleged abuse which was ultimately shown to someone who called authorities, Fox 19 reported, citing officials. Of disconcert, the lawyer told of the pair having ‘fostered over 38 children’ since first beginning fostering in February, 2013. A Friday arrest report noted the current children in the Combs’ care allegedly being beaten- including one child who was forced to hold a soiled diaper in their mouth as punishment. ‘He was 6 years old. He was noted in the affidavit saying, ‘When she’s mean, we pee our pants at night; she let us do squats and we have diapers in our mouth — pee diapers,’ Deddens said. Both adults were hit with several charges, including aggravated battery and domestic battery, among others. In total the couple were cited on 22 charges. The couple remain in jail on $250,000 bond and an additional $75,000 cash bond. Husband and wife are scheduled to re appear in court, October 5. Diane and Timothy Combs itinerary of alleged abuses.